The Problem with Thanksgiving (or “Why Every Day Should Be Thanksgiving”) | What Is Real True Love? Nor will this be a glib positive-thinking post about being more grateful. This will be a more tough-minded tell it like it is no holds barred post about why we–about why any and all of us–should be more grateful and appreciative, and how to get there. And if this posts makes you feel guilty or “bad” for not being more grateful, then good: better feeling guilty and bad now rather than regretful later when you can no longer do anything about it. My hang-up with Thanksgiving—and with holidays and celebrations in general—meaning with Christmas, with Valentine’s Day, with birthdays, with wedding anniversaries, with Memorial Day, with Veteran’s Day, et cetera—is that they are one and done once a year one occasions. And they shouldn’t be. They really shouldn’t be. These holidays—and the values and virtues and character traits they encourage—deserve better. They deserve much more. They deserve to be(come) deeply internalized and deeply held/cherished beliefs and values. And doing so requires something more than a one and done (and commercialized) approach. For life and a world where we belong. I am grateful for my circumstance. Helping me know how to show what I feel. I am grateful to be on Earth at this time! And rich with belief of the pure light inside. All year long I am grateful for these things. To internalize something requires practice—doing something over and over again until what was once foreign and difficult has become easier and more natural—second nature. Being thankful for one day is just a start. The twelve days of Christmas—reviving that tradition—would be better. A wedding anniversary month or a birthday month or The Thirty-one Days of Christmas or Thanksgiving would be even better (Ramadan lasts 29 or 30 days). The 365 Days of Christmas or Thanksgiving Year would be best. The goal is internalizing what these holidays *really* mean. And that can’t be done by just a one and done approach to life. Gratitude / appreciation is a virtue, and as such it represents a very deliberate and systematic approach to life. Which means that gratitude / appreciation is much more than a feeling or a welling up of the heart. It’s about seeing—about how we see—and training and encouraging ourselves to see things—situations, people, relationships—in a certain way. Gratitude is about how we perceive and how we think about what we encounter. Seeing that what we have, seeing that even though we might not have everything we want or the best of everything, what we do have is more than many people elsewhere have, that it is enough, and that what we do have is something that we can and ought to be grateful for if we appreciate it and get beyond our constant craving. This is the essence of “carpe diem”—not living recklessly and leading a life of unquiet desperation where one tries to check every item off one’s self-indulgent bucket list, but rather being grateful, appreciative, counting one’s blessings, remaining cognizant of one’s blessings (even in the midst of difficulties or ennui or dissatisfaction), developing an attitude that allows to better focus on our blessings, all the while remaining mindful that life is uncertain, and that we all are fragile. Being grateful is not about having just a few sporadic “kairos” moments, going through the day beleaguered, angry, stressed, unappreciative, cranky, moody, unhappy, what have you, and not being able to wait for the kids to go to sleep so you can unwind with a glass of wine or a beer and curl up next to your spouse or zone out to the TV. To be living like this is not to be living: it is to be missing *much* of what is important. Being grateful—carpe diem-ing—means not losing the plot and sweating small stuff. It means not getting sidetracked by the little things. It means choosing the better part. Because one day, things will be otherwise (as in *will* be otherwise). Gratitude is many things: it can be a feeling, but really it is much more than that: it is a virtue, an attitude, a state of mind, a systematic approach to life and a way of living, a way of perceiving events and situations and relationships and people, a way of thinking about what we see and encounter. Which means that it is ultimately an ability or a capacity—something that can develop, something that can be enhanced and deepened with training, with taking it up and practicing it as deliberately and as systematically as one would any new discipline or pursuit or hobby or sport. One day of giving thanks and being grateful just isn’t enough to create the habit, not to mention the character trait. If your life is good, great, decent, okay, even just passable, then this is a great time to begin cultivating a habit of seeing things in a more grateful and appreciative way. First of all, developing a habit of being more appreciative will help you become a happier person as well as a nicer and kinder person to be around. And just as importantly, if not even more so, it will allow you to not miss the blessings in life that you have around you, the good and meaningful things and people in your life that you might miss if you were being unappreciative, self-absorbed, grumpy, irritated, negative. Also, being grateful and appreciative will lead to less regret later—again, this is what carpe diem / seizing the day is really all about—not living in such a way now that when we come to die we are filled with regret and realize that we did not truly live. No one on their deathbed wishes that he or she had worked more, played with more fancy toys, bought more stocks or real estate, et cetera. What the vast majority of people at the end of life wish they had done more was love more, cherish their family more, live with greater courage and clarity (yes, maybe see a few more places, jump out of an airplane or two, but family, love, service, compassion, leading a more spiritual and evolved life with top the list), listen better and more often, live less selfishly, numb themselves less, et cetera. “[S]ome things don’t matter much—like the color of a house. How big is that in the overall scheme of life? . . . The whole problem with people is they know what matters, but they don’t choose it. The hardest thing on earth is choosing what matters.” – Sue Monk Kidd, abridged from “The Secret Life of Bees,” pg. 147. “Gratitude unlocks the fullness of life. It turns what we have into enough, and more. It turns denial into acceptance, chaos to order, confusion to clarity. It can turn a meal into a feast, a house into a home, a stranger into a friend. Gratitude makes sense of our past, brings peace for today, and creates a vision for tomorrow.” – Melody Beattie, abridged from her book, “Gratitude: Affirming the Good Things in Life,” pp. 3-4. Gratitude is dependent first of all on actually seeing what we have—not what’s missing, not what we don’t have, but actually seeing what we have, seeing what’s right in front of us or what’s all around us—and then valuing (or appreciating) it properly. Many people seem to live ungratefully, they live as if life goes on forever; they’re like children, never satisfied; they’re always wanting more and more, striving for this, working extra for that, living for some future where they will have it all, and in doing so they seem to miss out on so much of what they have now. They see nuisance, annoyance, sources of irritation all around them. They don’t smile or laugh. Either often or deeply. The kids are messy. People drive too slowly. There’s too much traffic. The house is too small. There’s never enough time to get things done. We need more of this or that. And so it begins. Ungratefulness. When that level of dissatisfaction and non-appreciativeness, non-thankfulness becomes chronic in a person, it’s as if that person has a disease. Nothing–or hardly anything–ever seems good enough. The half-empty glass appears three-fourths empty. Life and relationships are painted black and bleak. Whatever they have they don’t appreciate or take care of. Everything is a potential cause for complaint or irritation. Such a person has (little to) no perspective. Life has no value. They’ve lost the plot. We have to have some sense of perspective when we are looking at things. In order to value something appropriately or properly, we have to look at it with perspective, we have to view it in an informed way. This would be a good place to start. One of the best ways to learn the true value of something is to think of what life would be like without it, or without someone. It’s easy to get caught up in the messiness or clutter in this or that part of the house, or in how nice it would be to have a bigger house or a bigger bathroom or more closet space, but . . . at least you have one working bathroom, at least you have a roof over your head, at least you have enough clothes that you could use more closet space. That’s the beginning of perspective and thus the gratitude. And none of the messiness would likely matter should some tragedy or misfortune happen to the mess-maker. When the shite goes down, when a person we love is laying helpless in a hospital bed fighting for his or her life, so much of what we thought we cared about and so much of what, through our actions, we were showing that we thought actually mattered, no longer does. The size of the house? At that moment, utterly unimportant. The clutter or messiness or the person’s lack of punctuality? A complete non-issue. *That’s* perspective—whenever we look at what we have and who we have as if for the last time—when we see people as fragile, imperfect, impermanent, hurt, struggling, and riding on a common train—then we have perspective. When we don’t see others and ourselves in this way, we’ve lost perspective. And we’re likely falling prey to ungratefulness. Having *real* perspective–and keeping it up and running in ourselves and in the way we see life and others and ourselves and difficulties–is essential if we are to develop genuine gratitude. This entry was posted in "Calm Before the Storm", "Otherwise", "The Secret Life of Bees", (Luke 10:38-42), “Thanks”, Eckhart Tolle, Gratitude, Gurdjieff, Jane Kenyon, Louie Schwartzberg, Mary Baine Campbell, Maslow, Melody Beattie, Mental Health, Momastery, ProfessionsforPeace.com, Robert Fulghum, Spiritual Growth, Sue Monk Kidd, Thanksgiving, Truth, W. S. Merwin, Waking Up and tagged "Calm Before the Storm", "Otherwise", "The Secret Life of Bees", “Thanks”, Eckhart Tolle, Gratitude, Gurdjieff, Jane Kenyon, Louie Schwartzberg, Luke 10:38-42, Mary Baine Campbell, Maslow, Melody Beattie, Momastery.com, ProfessionsforPeace.com, Robert Fulghum, Sue Monk Kidd, Thanksgiving, W. S. Merwin. Bookmark the permalink. Why can we not live each day. We can embrace any situation, but we should first live for the day. Why should we celebrate one particular day, it is more like a bad practice for only one day. Carpe diem. I’m happy to read your words. Blessing and Love as well! And thank you for reading and commenting, Pawan. Doing something for one day only, or really only focusing on it for one day only *is* indeed a bad practice. To really learn something requires that we internalize it, that we practice it over and over again, that we even try to teach it (one of the best ways to learn something better is to have to try and teach it! ), that we are able to really put it in our own words and draw those words from our own life experience, and that we have some sort of “aha!” moment with the idea–that we have an epiphany. And visiting something–something as profound as Thanksgiving (or ThanksGIVING) or any holiday where the focus is not on us but on others and on giving or giving back or being grateful–one day a year just won’t affect real change. I’m glad this post resonated with you, Pawan, and I thank you for taking the time to write such a very thought-provoking comment! I’m grateful to read such thoughts. To internalize and question our own existence, is the teaching of life. I’m so in love with your words, and your every word is true. We have this life, and we should explore, observe nature — for moments are lessons. 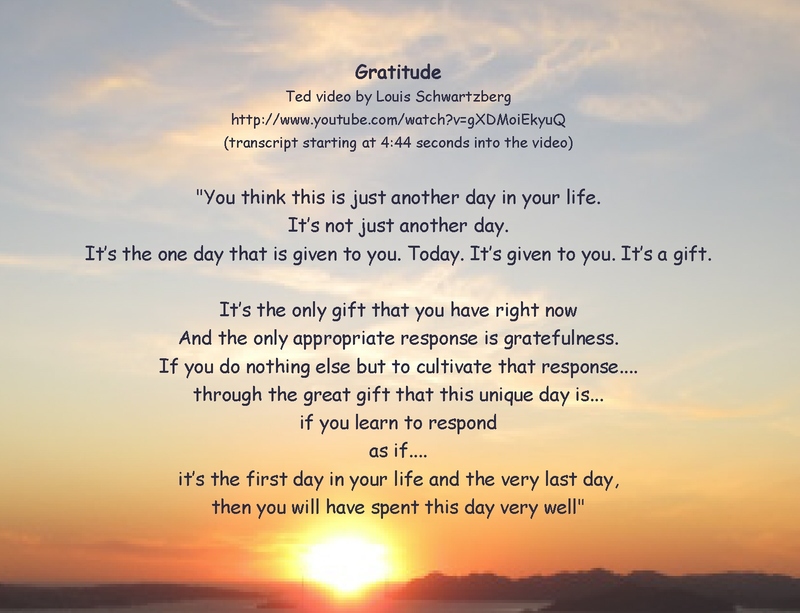 Thank you for this beautifully inspiring post about gratitude. I especially like the Practice, Practice, Practice part – for it truly is a virtue that anyone can develop, like a muscle from use. The quotes and images and videos are all inspiring. You, and your wise sharing here, are greatly appreciated! Thank you, Gina, for reading and for taking the time to comment. I appreciate it. And this post was a bit rushed–I wrote it on Thanksgiving day and I tried to get it done while wife and children were asleep, so I didn’t have as much time as I would have liked. I would love to include your poem from a few weeks ago and a link to your post as well, if that would be okay with you, Gina. And that is well put, what you wrote above–that gratitude is a muscle–it is indeed. I think all of the virtues are muscles, and I do think we live in a time (and has there ever been a time where this wasn’t true?) where for many people, their (our) virtue musculature is atrophying. It takes effort to develop the virtues, it takes effort (most of the time) to do the right thing (the wrong thing, or the less than best things wins out so often simply because it is easier in the short run and more gratifying more quickly or instantly). How much better would it be if more of us had the understanding that developing our character and our compassion and understanding and developing an orientation of true gratefulness and kindness were valuable and important work that we could and ought to do, and that everyone ought and need to do for oneself, and that we could approach it in a way similar to how we get more fit physically? That by watching our diet (watching what we read, not stuffing our minds with intellectual junk food, books that are like Häagen-Daz), exercising and stretching (having meaningful conversation, talking and learning about the virtues, developing a more open and curious and inquisitive and less rigid mind), monitoring ourselves and our progress (becoming more self-aware and in tune with ourselves, as well as more honest and objective about ourselves), and giving ourselves some time to relax and then recover, would make us better, stronger, wiser, and more humane people. That is how I look at “self-development.” Thank you, again, for your lovely comment, Gina. John you are tremendously inspiring! This remarkable reply to my comment is a worthy post in itself. Your comment that our ‘virtue musculature is atrophying’ is as brilliant as it is profound. I believe completely in being aware of what we are putting in our minds and avoid Haagan-Daz mind material. I adore PBS. Nova and Nature continue to amaze me. And the writers! Like you and many in this blogging world with valuable, enriching thoughts to share. All around me here as I sit are enlightening works from the likes of Chopra, Dyer, and Williamson to the Dalai Lama and the Bible. As well I often think of the teachings of Jim Rohn on the importance of being aware of who you are ‘rubbing shoulders with’ as we tend to become like the people we spend the most time around. I am blessed with a husband of such good humour and genuine kindness who inspires me every day. As well as friends who listen and uplift. And blogging friends such as yourself all contribute to helping make me a better person, and the more I can shine brightly out into the world. Thank you for rippling your light out towards me. PS: Absolutely anything you would like to share or reblog from my site would delight me! Hello Mel! I hope you and yours had a lovely Thanksgiving! And I love the Melody Beattie quote (as in LOVE!) and I have read it before but I didn’t have it mind when I was writing this post and I know just where to include that quote in the post above. So thank you, Melissa, for sharing that quote! Being a Warrior isn’t easy. One of the greatest challenges is being surrounded by non-Warriors wherever your turn. Heraclitus was right when he said only 1-in-100 is a Warrior. That means 99 out of 100 people you encounter every day have not yet discovered the true limitless and importance of gratitude. They fret and complain about everything they don’t have or are trying so desperately to achieve, but don’t focus on what they have and show appreciation for it. They stress over another Christmas and are completely oblivious and ungrateful for countless past Christmases. Their mentality is “more, more, more” and they’ll never be satisfied. Ever. It is the Warrior’s duty to recognize these ingrates, to put a foot down and make it crystal clear that satisfying their never-ending greed is not one of our mission priorities. Imagine telling a person who is perpetually worrying and stressing over not getting what they want, “You’ll never be happy.” It’s shocking to many, I’m sure. It would seem so rude and brutally uncaring. And I’m sure most being told that would feel quite offended. What can I say? Sometimes that’s exactly what an incoherent, self-absorbed ingrate needs in order to come to their senses. Sure, Christmas is supposed to be a time of cheer and goodwill. But don’t let the lights, holly and presents blind you from the underlying hostility and frustration too many people exhibit while they’re trying too hard to be “jolly and merry” once a year. As I always say, we fall to the level of our training. A person cannot be an ingrate for 364 days of the year and then suddenly be grateful for all of the wonderful things in their life on that 365th day. Gratitude is a habit, not a spontaneous miracle. Be grateful on Jan 12th. Be grateful on March 21st. Be grateful from July 5th to September 13th. 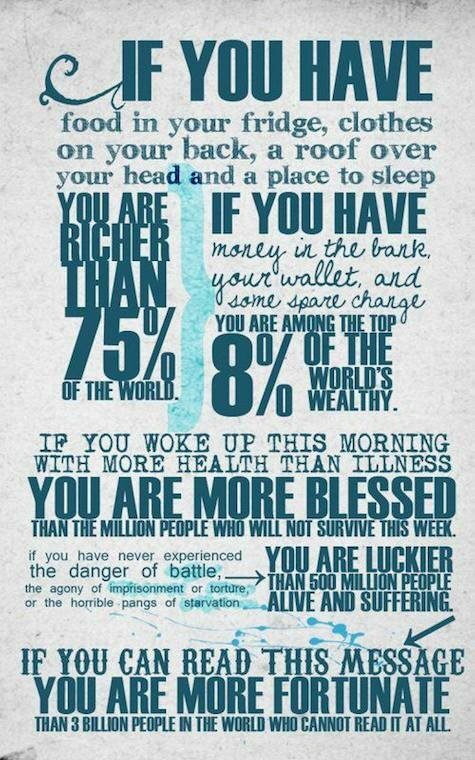 Be grateful every day. If you always have gratitude on your mind throughout the year, you won’t feel the slightest hint of frustration during a time of year where most people actually make an effort to try harder than they do the rest of the year. You can’t ace a test by cramming for it only the day before, and you can’t win a race by only training hard the day before. Same goes for Christmas. You won’t have that true “Christmas Spirit” unless you employ grace, understanding, patience and love throughout the year. There’s no cramming for Christmas! Those who do be warned; Warriors see right through the act. I believe we should never wait for birthdays, anniversaries, holidays, graduations, births, and promotions…to celebrate, feel joy, gratitude, & true happiness. We can wear clothes we have been saving for “special occasions” now, send thank you notes & buy flowers just because. I love your blog, I just found it through GYA blog and happy I did! :-D. This makes me think of Stevie Wonder’s song “I Just Called”! Lol I love that song. Thanks for reading and for the very nice comment and compliment. I’m glad you found my blog and that it’s resonating with you. I agree with you–we shouldn’t wait for special days to celebrate–celebration and appreciation and gratitude should be day in and day out practices and parts of our lives. Life is too short–and too capricious. It’s so important to let those who we care about and love know that, while we can, in “the living years” (a reference to that 80’s song by Mike + the Mechanics. I’ll see your Stevie Wonder reference and raise you a Mike + the Mechanics, lol). Gratitude, like love, is best defined not as a feeling, but as something so much more and different: as a behavior, as a way of seeing things, as a way of perceiving and thinking about things. Gratitude is an attitude, a way of looking at things. It is a conscious choice–something we can choose consciously. 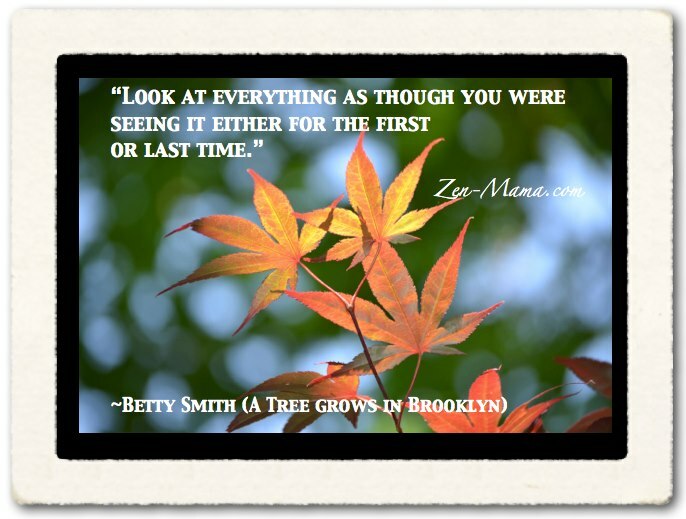 We can choose to see things as half-empty–what is normally thought of as seeing things pessimistically but what also means seeing things ungratefully, in terms of what is lacking. We can also make the choice to see the same situation, person, relationship with eyes that see more gratefully. It’s not a pessimist who sees the glass as half-empty, it’s the ungrateful, unsatisfied, good little consumer type of person who sees the glass as half-empty and who gets irritated with people who tell him or her to enjoy every moment with their children. A truly kind and grateful person sees the glass as half-full, sees life and relationships from a large perspective–from the perspective of knowing that things *could truly be otherwise*. Being grateful means not taking things and people for granted. It doesn’t mean that we feel shamed or guilted into appreciating them, because that would just be an ungrateful person trying to mimic being grateful. Rather it means actually understanding–really getting it, having an epiphany or an “a-ha” lightbulb moment–that things really could be otherwise and then rising to the occasion (the demands) of living in alignment with that insight. Gratitude takes practice. To live more gratefully takes practice–hours of practice–perhaps even 10000 hours to master. Which means that living gratefully will take determination/will-power as well. It will take effort and practice to begin acquiring the habit of seeing life and relationships with greater appreciation and not taking them for granted. It will take effort and practice to not take things (and people and health, et cetera) for granted. It will be a tough battle, because we will be battling ourselves and some pretty bad habits that took root in us when we were very young and naive. We live in a culture that encourages ungratefulness, dissatisfaction, as seeing the glass as half-empty; we live in a consumeristic culture based largely on planned obsolesence and instant gratification where we are constantly sold the message that we can buy our way to happiness and where we are constantly bombarded with advertisements bandying something as “new” (as in “NEW!”) “IMPROVED!” “MUST HAVE!” And we have been exposed to this pattern and this way of thinking and looking at things since we were young, since we first started watching TV, listening to the radio, or reading magazines. What you have isn’t good enough anymore, you need to keep up with the Joneses and get with what is new. And from “what you have isn’t good enough anymore” it’s only a very small step for most people to you aren’t good enough anymore because you don’t have the latest this or that, or the labels on your clothes aren’t classy or trendy enough. And so from an early age we are encouraged to “want the best for ourselves” in terms of what we life has to offer and that we can buy. We are taught to buy our way to happiness and to a better version of ourselves and to fitting in and being accepted. Constant craving and constant dissatisfaction are what drive a good portion of the economy, and these traits become embedded in us as ungratefulness, pessimistism, a chronic lack of appreciation, suggestability, the need for “retail therapy” (or “shopping therapy”; the beginning of the movie “Fight Club” was very good at parodying this). And so once a year many of us try to go against the grain of our conditioning and instead be grateful, appreciate what we have–all before the getting right back on the wheel and setting out on the biggest shopping day of the year and getting busy seeing what we don’t have, and what we are sold into believing we “need” in order to be happy, accepted, satisfied–at least temporarily, for a few moments or days. 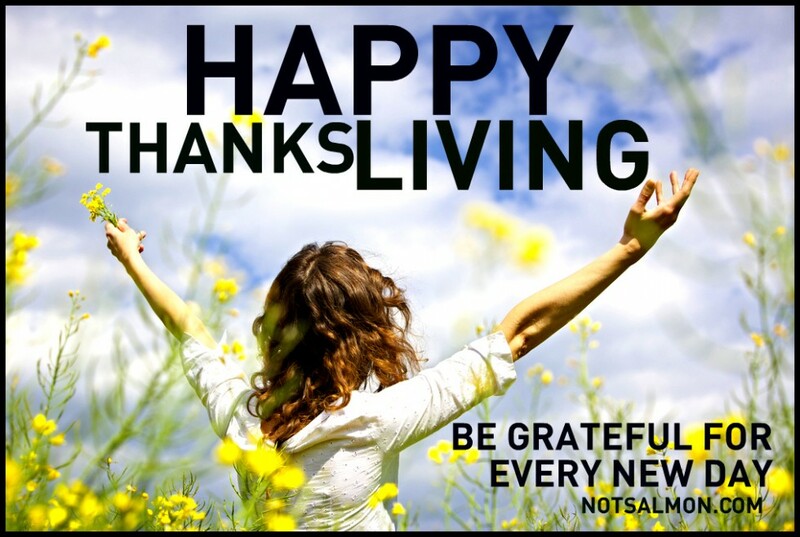 Pingback: How To Begin Being More Thankful | What Is Real True Love?